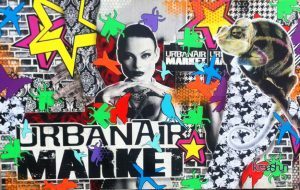 KREASHUN blast’s *URBAN AIR MARKET* in San Francisco! *KREASHUN* Brings FRESH new details to half of the “LIVE” Mural from last season again this season at the *URBAN AIR MARKET* in San Francisco! Urban Air Market “LIVE” Mural by *KREASHUN* San Francisco, Ca. http://www.urbanairmarket.com/ http://www.kreashun.com/ — at Urban Air Market, Hayes Valley.